On workdays the fathers gather in church thrice daily: at night for matins and lauds, which together lasts 2-3 hours, in the morning for the conventual mass and in the afternoon for vespers. The choral liturgy is in Latin and always sung, without musical accompaniment. Our Gregorian chant is part of the patrimony of our Order which we have kept from the very beginning, melodies favoring interiority and spiritual sobriety. Brothers participate on weekdays at matins and Holy mass. They are not obliged to take part in singing, though, of course, in silent prayer are united with the fathers office. On Sundays and Solemnities the fathers and brothers gather more frequently for communal liturgy; see Sundays and Solemnities. Communal prayer is carried over into solitary prayer by which we offer to God an intimate sacrifice of praise, transcending all words. A monk, therefore, provided he strives continually to cling to God, exemplifies within himself what is signified by the entire Liturgy, and with this, his whole life becomes a Liturgy unto itself. The little daily hours (prime, terce, sext, none and compline) are recited alone in cell. At the sound of the bell all pray at the same time, so that the whole monastery becomes a single act of praise to the glory of God. Besides the Divine Office our Fathers have transmitted to us the Office of the Blessed Virgin Mary. Ordinarily each one of its hours precedes the corresponding hour of the Divine Office. Once a week we also pray the office of the dead. 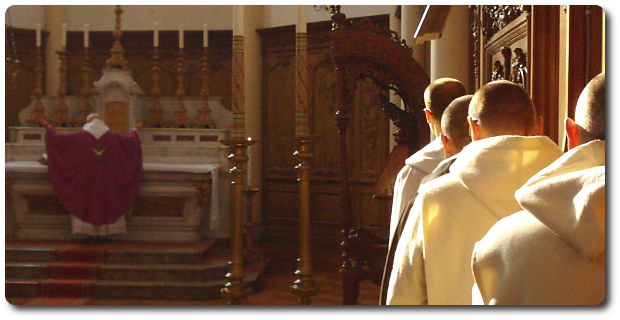 The monks who are priests each day before or after the conventual mass say their own mass as well in private chapels. Then, the humble offering of their life in the desert is taken up into that of Christ, for the glory of God the Father.